All will display on Blog and latest post will display on front page blog section. We’re just four days into “Toxic Isn’t Tasty,” our 2016 Think Before You Pink® campaign, and already our corporate targets are feeling the pressure. Since Tuesday, hundreds of you have sent letters to Wonderful Citrus and Bee Sweet Citrus demanding that they stop pinkwashing and stop watering our food with oil wastewater. In just 5 days, Breast Cancer Awareness Month, or as we like to call it, Breast Cancer Industry Month will be upon us. Store shelves are already filling up with pink ribbon products, and it will only get worse come October 1st. 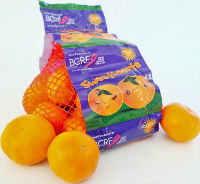 Companies will be trying to gain customer loyalty and increase their sales by pinkifying their merchandise. Breast Cancer Industry Month (aka October) is around the corner; soon store shelves will be loaded with pink ribbon products, from bread loaves to nail clippers. Each year, hundreds of thousands of people come together to participate in breast cancer walks and runs in cities across the U.S.
It’s almost here! 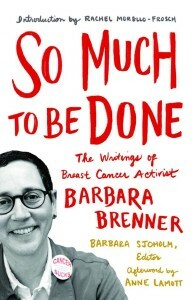 We’re celebrating that So Much to Be Done: The Writings of Breast Cancer Activist Barbara Brenner will be released on May 1st by University of Minnesota Press. My family is too familiar with breast cancer. 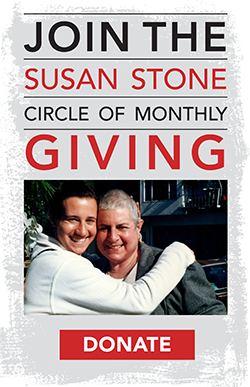 My mom, Susan Stone, died of the disease in 2002 when I was 31, and I was diagnosed with breast cancer five years later. I was devastated by mom’s death, and I hated that I had to go through my own diagnosis without her. From all of us here at Breast Cancer Action, THANK YOU. 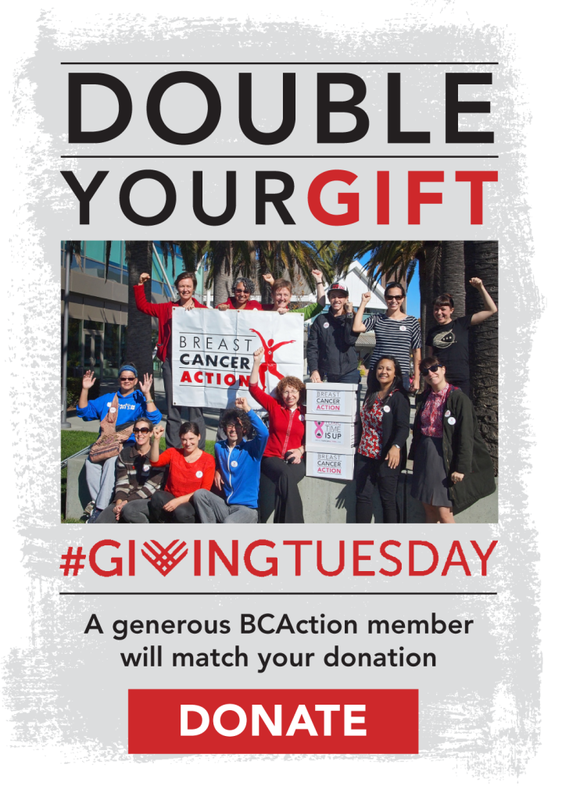 Get ready – on #GivingTuesday, a generous donor will match every dollar you donate to Breast Cancer Action up to $25,000, in honor of our 25th anniversary year. 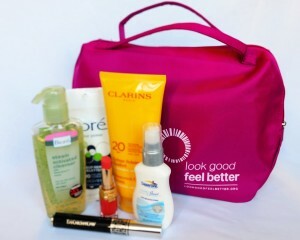 For more than two decades, the American Cancer Society and the Personal Care Products Council have been bombarding cancer patients with toxic cosmetics through their Look Good, Feel Better program. In December 2014, I was diagnosed with invasive breast cancer and had a bilateral mastectomy that same month. During my chemotherapy treatment afterward, I saw posters at my hospital advertising the American Cancer Society’s Look Good, Feel Better® program. 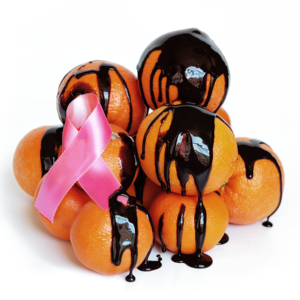 Breast Cancer Awareness Month (or as we call it, “Breast Cancer Industry Month”) is around the corner. 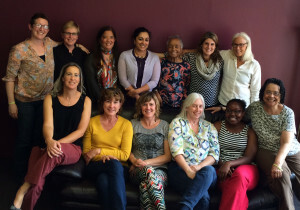 For 25 years, Breast Cancer Action has put women’s health first. Our founders never imagined that 25 years after they gathered in a living room together, BCAction would be 60,000 strong. 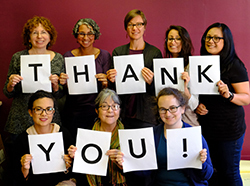 Thank you for being part of this amazing grassroots community committed to women’s health and social justice. Please join us on October 8 for our 25th anniversary event where we’ll honor all we’ve achieved together and recommit to all the work still left to do. Get your ticket today. Come with your friends and enjoy an additional 10% discount on a table for eight. 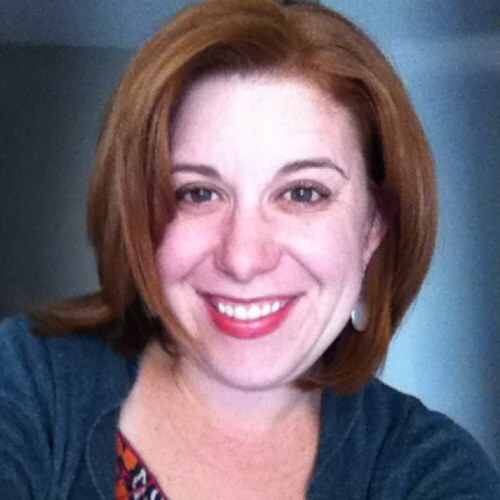 We’re thrilled that Rose Aguilar, longtime host of KALW’s show Your Call, will emcee the event. 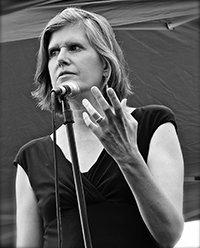 And we’ll be honoring acclaimed biologist, author and activist Sandra Steingraber, Ph.D. with the Barbara Brenner Hell Raiser Award for her exceptional work on environmental toxins linked to breast cancer. If you can’t be there in person, be there in spirit by purchasing a tribute ticket. 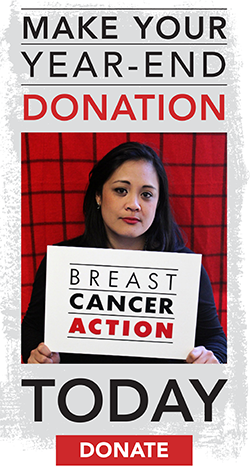 And it’s not too late to support Breast Cancer Action by becoming an event sponsor. 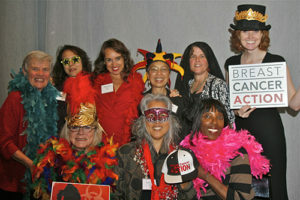 I feel so grateful for all you do to support BCAction. I hope you can join us on October 8 to honor 25 years of independent, grassroots activism for women’s health.